Last week Scivera president, Joe Rinkevich, presented at the American Association of Textile Chemists and Colorists (AATCC) International Conference in Greenville, South Carolina USA. The presentation was part of the “Concept 2 Consumer” track at the 3-day annual meeting of textile and apparel brands, suppliers, academics, chemical companies, and service providers. In his presentation, Rinkevich outlined trends in chemicals screening and management that are gaining momentum in the textile industry. 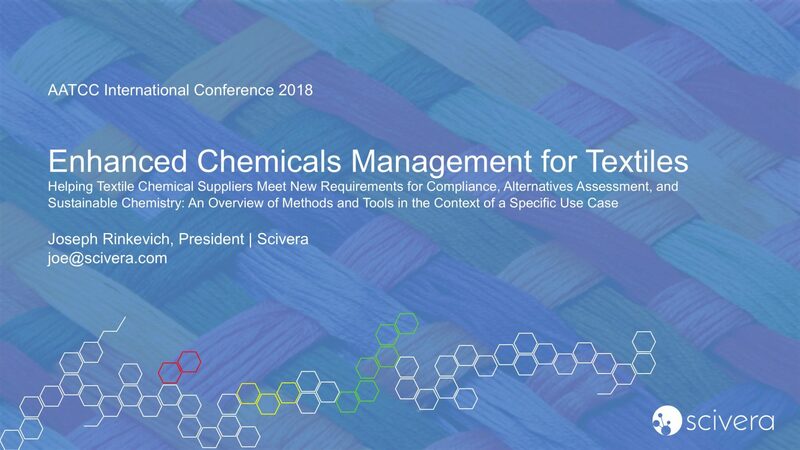 Please contact support@scivera.com for a copy of Scivera’s AATCC 2018 presentation. Textile chemicals management has traditionally meant screening products for restricted and regulated chemicals. This compliance-based approach is no longer sufficient for many brands, retailers, and other stakeholders. Leading companies are now looking for cost-effective and efficient ways to better understand the actual human and environmental health characteristics of chemicals and formulations. This deeper insight provides critical information for formulators and procurement managers to not only document compliance with regulations, but realize product stewardship and sustainability goals for their company and their customers. Screening products only for chemicals that have made one or more restricted substance lists (“RSLs”) is “like driving while looking in the rear view mirror,” said Rinkevich in his presentation. “If a chemical has made a list, it’s because concerns have been known for many years. Understanding a chemical or formulation for its underlying human and environmental health characteristics enables selection of preferred substitutes that won’t show up on an RSL in the future.” Leading brands recognize this and are implementing these strategies in their product development and sourcing processes. SciveraLENS Rapid Screen enables cost-effective screening of chemicals for the critical, deeper knowledge of human and environmental health characteristics as well as tracking RSLs of interest for basic compliance.